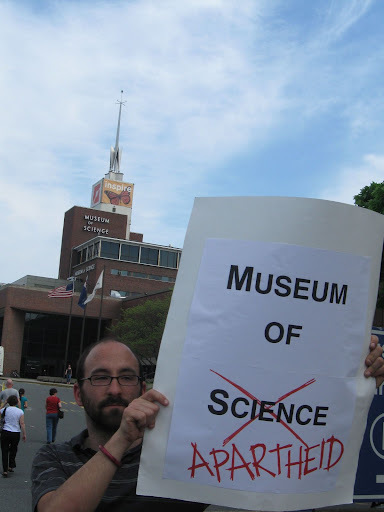 A press release from Boston-area BDS activists: Boston, MA, May 3, 2010 – Local activists protested the so-called “Israeli Innovation Weekend” (IIW) at the Museum of Science in Boston through multiple, disparate actions on Sunday. 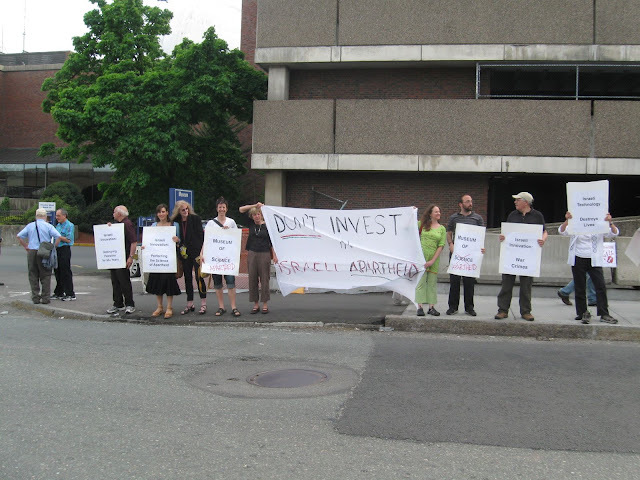 IIW’s sponsors, including the Consulate General of Israel to New England, were left flummoxed by the activists’ efforts and largely unable to prevent their successful, multi-pronged disruption of the event. Protesters targeted IIW because it was part of a state-sponsored campaign to “greenwash” Israel’s discriminatory, apartheid regime and atrocious human rights record. IIW was officially sponsored by the Israeli Consulate, which also played a major role in funding and planning the event; nearly half of IIW’s steering committee was composed of Consulate staff and the Consulate was one of the top donors. Throughout the day, protesters maintained a visible public presence outside the Museum. 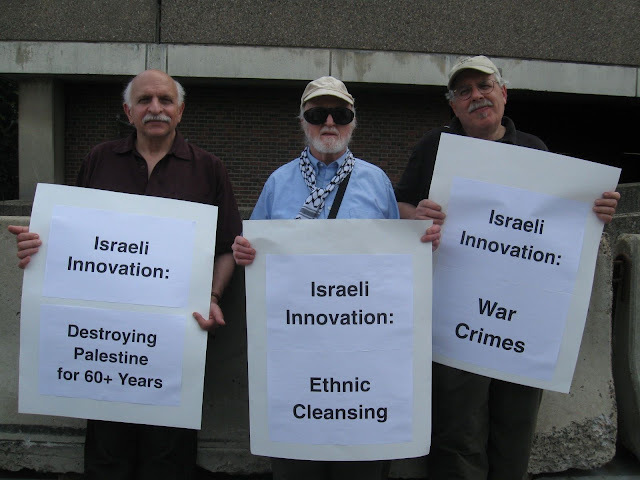 Protesters held signs drawing attention to Israeli “innovation” in technologies of death such as white phosphorus and cluster bombs, parodying the exhibit’s slogan, “Healing the World Through Technology.” Across the street from the Museum, demonstrators also prominently displayed a large Palestinian flag from the adjacent East Cambridge Lechmere Viaduct Bridge. The protesters’ message was seen by hundreds of Museum visitors and passing tour groups, many of whom called out or honked horns in expressions of solidarity. Meanwhile, inside the Museum, lone activists stealthily replaced the IIW program with a duplicate program, virtually identical in appearance but which highlighted themes of the Israeli science and technology sectors’ complicity in water theft and other abuses. The front of the program named Israel “The World’s Leader in Cutting-Edge Apartheid Technologies,” while inside the program, titles of IWW lectures were re-printed with altered titles. For example, “Sunshine and Sustainability: Israeli Leadership in Solar Technology” was renamed "Sustainable Darkness: Israeli Innovations in Torture Technology and Extra-Legal Maneuvering,” while “Sharing Water in the Middle East—Israel’s Cross-Border Water Resource Strategy” became “Strategic Water Appropriation in the Middle East: Might Makes Right.” IIW organizers were overheard multiple times expressing anger and frustration at their inability to determine who was “plastering” the exhibit with this literature. Download a copy of the brochure here. Activists surreptitiously distributed this material for more than two hours before finally being discovered and asked to leave the Museum. Yet Museum staff were observed reading the alternative program and several expressed sympathy with the activists’ cause as they were escorted out of the Museum. Finally, yet another group of activists infiltrated the last panel lecture of the day, entitled “Israeli Technology: An Investor's Perspective.” As the panel began, two participants unfurled a giant banner reading “Don’t Invest in Israeli Apartheid.” After the activists were shouted down by the audience and removed by Museum security, others continued to disrupt the session every five to ten minutes, individually standing up and interrupting the lecture by condemning investment in Israeli technology, calling for justice for Palestinians, or singing liberation songs. One disrupter referred the audience to the report about war crimes in Gaza by the UN inquiry commission led by South African jurist Richard Goldstone if they truly wanted to know more about Israeli technological innovation. Another declared that investing in Israel was investing in the dispossession and genocide of indigenous people. Yet another sang a re-written, Palestine-specific version of Sweet Honey in the Rock’s Chile Your Waters Run Red Through Soweto. In sum, the activists made it impossible for the event to proceed and visibly agitated the audience.